Mountain-building is a result of the constant movement of plates on the surface of the Earth, driven by heat from Earth’s core. 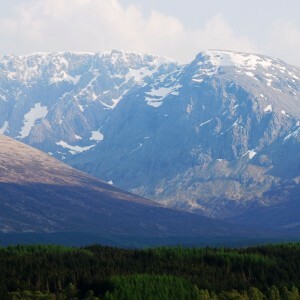 The series of powerful earth movements and collisions that built the Caledonian mountain range are collectively known as the Caledonian Orogeny, but the mountains north-west of the Great Glen and those to the south-east have had different histories. The Great Glen, the nearly perfectly straight valley that extends from Fort William to Inverness, and contains Loch Lochy and Loch Ness, follows the line of a fault that is a major feature of Earth’s crust. It can be traced northwards through the Shetland Isles to the Arctic islands of Svalbard and is one of the most striking features on satellite images of Europe. The rocks that underlie most of the Highlands north-west of the Great Glen are called the Moine Supergroup. They were deposited as sand and mud in a shallow sea between 1000 and 870 million years ago on the edge of a super-continent called Rodinia, and have experienced three phases of mountain building, the Knoydartian, Grampian and Scandian orogenies, respectively 870–790, 470 and 430 million years ago. The heat and pressure deep in the mountain range caused the minerals in the rocks to recrystallize, a process called ‘metamorphism’. The most common Moine rock is schist, with gleaming flakes of mica, formed from mixtures of mud and sand. South-east of the Great Glen the mountains are built of rocks of the Dalradian Supergroup. They were laid down as sediment between 800 and 600 million years ago on the edge of an ancient continent called Laurentia (modern Canada) which formed after the break-up of Rodinia. The Dalradian rocks are more varied than the Moine and include white quartzites (formed from pure sandstones), marbles (metamorphosed limestones), and slates (formed by deep burial of mud). The Dalradian rocks experienced only the Grampian orogeny. When two adjacent sections of Earth’s crust have different geological histories they are called ‘terranes’. The Great Glen fault is a ‘terrane boundary’ between the Northern Highland Terrane and the Grampian Terrane. The Scottish Highlands are the world’s most intensively studied ancient mountains. 470 million years ago the edge of Laurentia, where modern Scotland was located, then about 30° south of the Equator, collided with a subduction zone, where the ocean floor was descending into Earth’s mantle. This caused rocks of the continent to be crumpled, folded and pushed on top of each other, the Grampian orogeny. The continent of Laurentia was at the time separated by an ocean from a smaller continent called Avalonia, carrying the rocks that now underlie England and Wales. 430 million years ago Avalonia collided obliquely with the margin of Laurentia, and Scotland and England were united along a line very close to the present-day border. The oblique collision led to the Scandian orogeny and caused faults with sideways relative movement to develop along the edge of Laurentia. The Great Glen fault is the largest of these. The Moine rocks of the Northern Highland terrane and the Dalradian rocks of the Grampian terrane have moved laterally as much as 500 km relative to each other along the line of the fault, which continued to move for at least 50 million years. 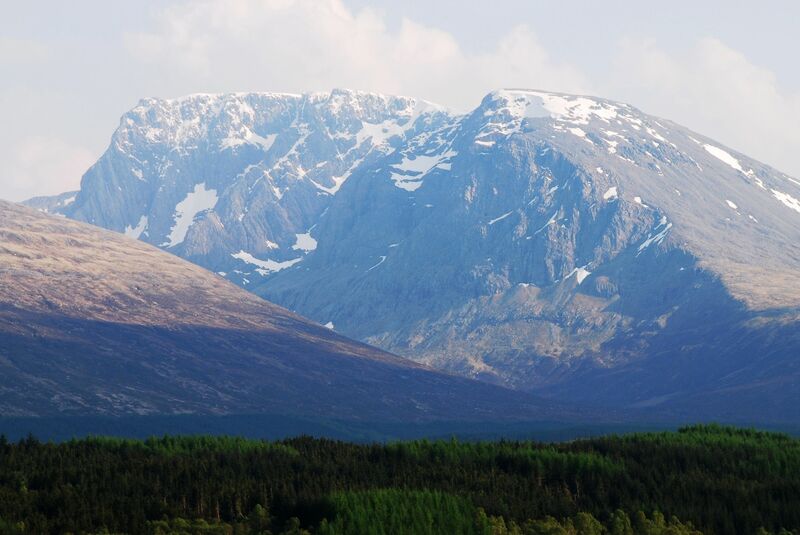 The mountains we see in mainland Lochaber are the eroded roots of the Caledonian mountain chain, formed over 400 million years ago. The peaks were then as high as parts of the present-day Himalaya, and extended for over 5,000 kilometres across a vast continent.